Located at 256 Brunswick Street, Fitzroy, in lively Brunswick Street’s café and food precinct. More than a bookshop, with a welcoming Quiet Room in which to relax, unwind and try out some of our guided meditation CDs. Tap into positivity, find solutions, re-energise and gain new perspectives on how to respond to the daily challenges of life. 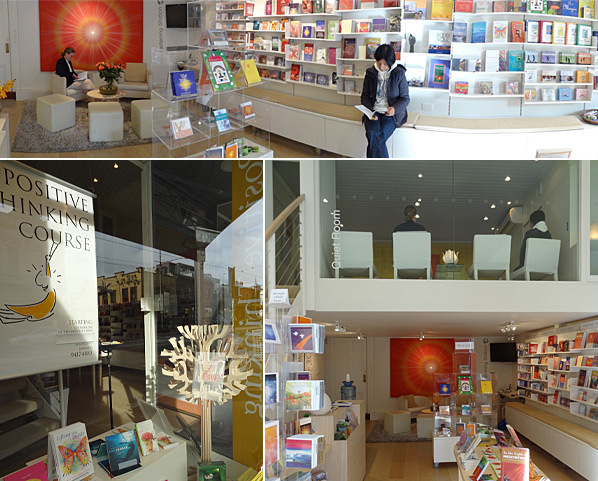 Our shop is located on the ground floor of the Brahma Kumaris meditation centre - an oasis of peace. Come in and browse our range of products at leisure, or speak with our onsite meditation teachers, who welcome your questions and will guide you in trying out meditation. Also on offer are courses in positive thinking and meditation.